Even though more than two months have passed since the Episcopal retreat in Poznan and we are already preparing the next retreat, only a few days ago, motivated by the Rev. Prof. K.M.P. Rudnicki, who wants to publish it in his magazine Praca nad Soba, I recreated from memory the reflection I delivered then during the Eucharist. You will find it below. Readings: Deuteronomy 4, 1-2; 6-9; Mark 7,1-8; 14-15; 21-23. What will be left after we’re gone? Religions are not eternal, even though they do what they can in order to make it seem as though they were. And still – as everything in this world – they have their beginning, their history and often also their end. They become then at best a memory or an object of studies. What will be left after we’re gone? If it depended on us, what would we like a scholar of our times to bring out of the darkness of the past – in a few hundreds or perhaps thousands of years? Interestingly, in the Gospel for today Jesus deals with a similar question. Christians sometimes perceive the Old Testament rules pertaining to ritual purity as something marginal, of little significance. But for the Jews they have a totally different meaning; they touch upon the very essence of their religion. So in today’s Gospel the Jew Jesus is confronted with the question asked – in a quite aggressive manner (for as an accusation) – by his fellow Jews about what was for him the essence of the faith they all professed. Also during our conversations the topic of God’s Law and it’s role came up a few times. We said that it was/is meant to prepare people to spiritual independence. The churches often forget that the rules they preach are never an aim in themselves, that they are meant to prepare people to attain such a level of spiritual development that external prohibitions and obligations won’t be needed anymore, for they will find their way into the very hearts of people, they will become their integral part. Religious upbringing should then always point to freedom, to inner liberty, to independent thinking, feeling and judging. Speaking about the various roles of the Law, we haven’t yet mentioned the one sketched in today’s Old Testament lesson: the Law as the line separating those who obey by it from all others. We know it from our own experience. We like very much to draw such lines. We very often treat the world around us as something fundamentally different, “impure”, dangerous. We very often think as if the church – the People of God – were here and not behind these doors anymore. There are those those whom we should, at best, “convert” – to our way of thinking, of course. Yet Jesus says something different: it is not from the outside that danger comes. It is not from the outside that this what might “pollute” us comes. It’s not “the others” that pose a danger to us, it is not them that we should fear. The source of the danger is we ourselves – our own hearts. And now I would like to take a step in a direction that may surprise some of you. We have gathered here this morning in order to celebrate the Eucharist together. In a moment we will come over to another room and there stand around the altar. We wanted very much that priests be among us, and we did what we could to make it happen, in order to be able to celebrate the Eucharist at which they would preside. We are very grateful to Br. Pawel and the Rev. Tony Litwinski for finding time and coming to Poznan, because the priestly ministry is very important to us and not only in the functional sense. Priesthood is not only a function which enables something to be done according to the rules of the church, it is above all a sort of lens where the things that make the church come together – it is a living symbol making the essence of our calling visible to us. That is why Anglicanism, also in the middle of the storms of the Reformation, preserved the continuity of the threefold spiritual ministry of deacons, presbyters and bishops. For us their ministry is not a marginal “addition” to the church, but is rooted in its very essence, even if it always was subject to and will always be subject to historical changes and be shaped according to local circumstances. It can be seen precisely when we celebrate the Eucharist. But on the other hand our priests will in a while stand around the altar hand in hand with us, simply as ones of us. And this points to another – not less basic – dimension of the Eucharist. Not only they carry it on their shoulders. Not only on them, and even not on them in the first place, depends the authenticity of what we will be doing in a moment. The Sacrament of Christ’s Real Presence among us is rooted in his promise (“I am with you always, even unto the end of the world”), but also in our reaction to it. On our way here we prayed the Daily Office for the typical for Mariavitism, and at the same time giving rise to many misunderstandings and controversies, Commemoration of the Cessation of the Eucharistic Sacrifice. What is it about? In the last revelation from the series given to the Blessed Maria Franciszka, she wrote that she was said that Christ will not descend on altars where the sacrifice of the Holy Mass is not celebrated worthily. What does it mean? This entry was posted in English entries and tagged Anglicanism, Eucharist, Mariavitism, sermon, The Episcopal Church, Worship. Bookmark the permalink. Toward the end of my reading I realized tears were streaming down my face. This is extraordinary, Jarek! I am so very proud to have you and Lukasz represent The Episcopal Church, my own beloved church, in Poland. 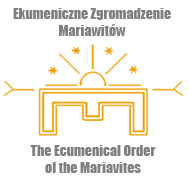 As I follow your work and pray for The Polish Episcopal Church I find my own faith being renewed. That’s an amazing Gift. Thank you! I will recommend this to my congregation Sunday and have copies available for them. God bless you and all who are working for The Episcopal Church in Poland. You remain in my prayers and in my heart.